Today, at Westport’s Project Return, the Westport Woman’s Club’s Ruegg Committee presented their 2016 Ruegg Grant, in the amount of $10,000, for use in repainting the group’s facility, a historic house on North Compo Road. 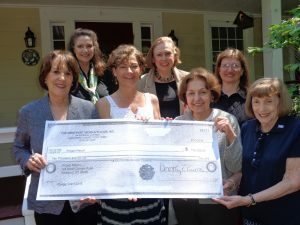 Project Return’s Laura Bard, Development Director, and Tessa Gilmore-Barnes, Interim Director, front row left, receive the check from WWC Community Services Chair, Mary Gladden, and Jo Luscombe, front row right. Looking on, 2nd row: the WWC Ruegg Committee’s Dorothy Packer and Nancy Saipe stand on either side of Dorothy E. Curran, WWC President. Missing from photo: Barbara Stemmer, WWC 2nd VP Finance.